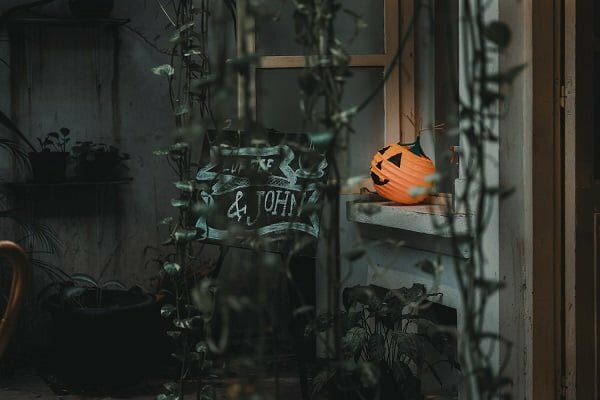 Want to make your outdoor Halloween decorations stand out? You need some unique inspiration. Here are 20 of the best ideas for Halloween 2018. While it’s important to decorate your home for Halloween, it all starts outside. After all, everyone can see your house and how well you’re prepared from the street. Trick or treaters will come to your home and it’s important to greet them with spooky decor. That’s what the fun of Halloween is all about. 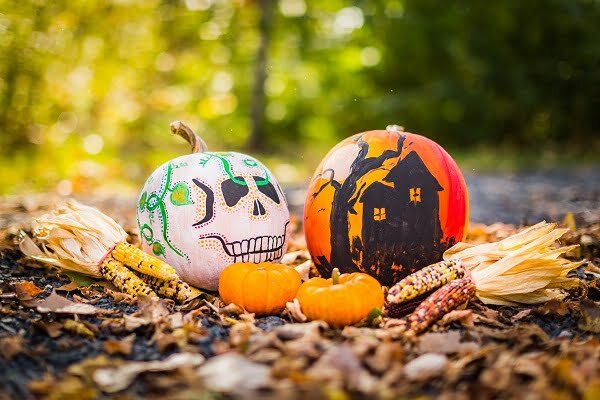 From pumpkins to Jack O’Lanterns, from skulls to bats, from witches to skeletons and Halloween inflatables – there are so many themes and props to choose from. You can make your outdoors spooky and detailed or classy and inviting. And don’t forget the Halloween lighting too. It can get overwhelming quickly. So to help you out, we’ve come up with a list of the best ideas for this Halloween. We’re confident you will get inspired! 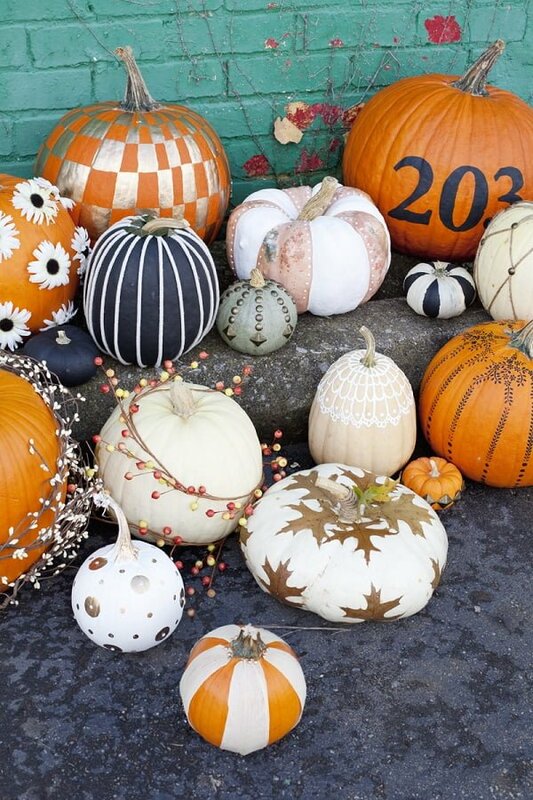 There are many ways to decorate with pumpkins, and we hope you have stocked up. 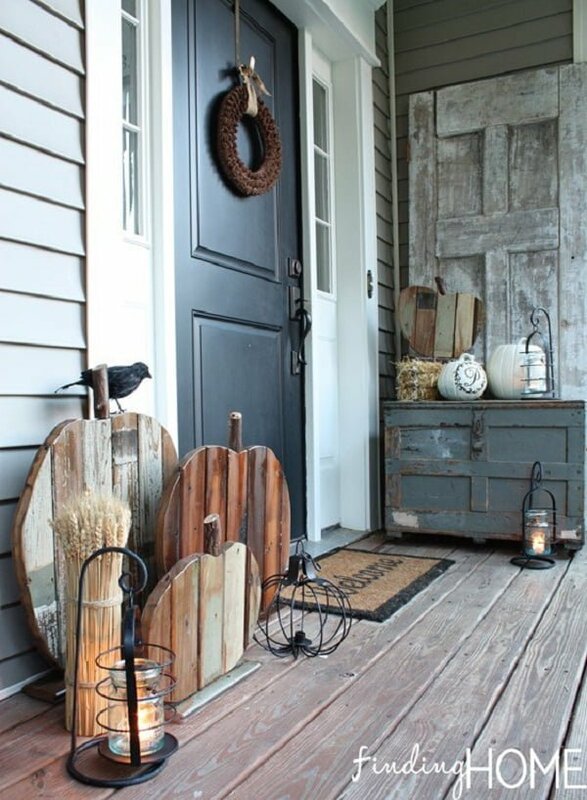 This Halloween, try something stylish to decorate your porch. Liz Marie does that so well. The abundance of multi-colored pumpkins and flowers in rustic buckets is so charming. Add some Jack O’Lanterns to the mix, and you have warm and cozy outdoor Halloween decor. It’s very welcoming, and your trick or treaters will be delighted with how you greet them. Front door signs work for many occasions and Halloween is one of them. Greet our trick or treaters with special signs made for them. These big sidelight signs in farmhouse style make inviting decor. And you can make them yourself too. For this DIY project, you’ll need two plywood boards, paint, and craft supplies. Check out the tutorial on how to complete it. Add some pumpkins and Jack O’LAnterns, and you’re all set. 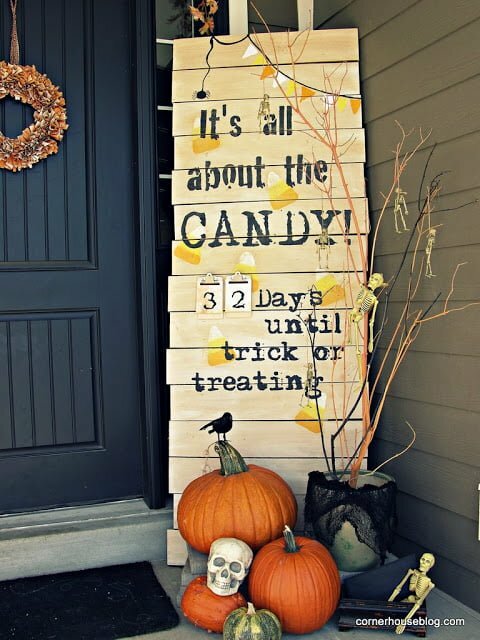 While there’s some time still left until Halloween, why not make a decorative sign with a countdown as your front porch decor. This sign idea is a beautiful rustic piece which will add a lot of value to your decor. Check out the tutorial on how to make it and also add some mandatory Halloween accents, such as pumpkins and skulls. Now we’re all set for trick or treaters. One of the go-to ways to decorate your porch has to be placing candle lanterns up the steps. It’s a brilliant way to set up festive lighting too. 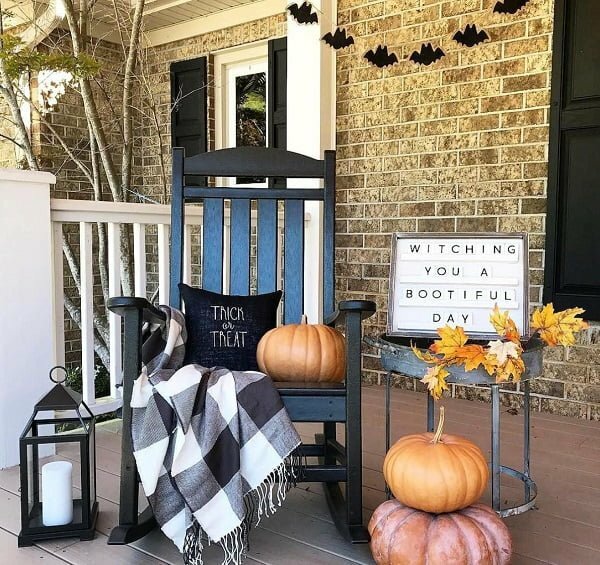 Add some pumpkins or other Halloween accents to the mix, and you have great outdoor decor for the occasion. In this example, we can also see a nice addition of a black metal cat decoration which adds a lot of Halloween-style charm to the look. 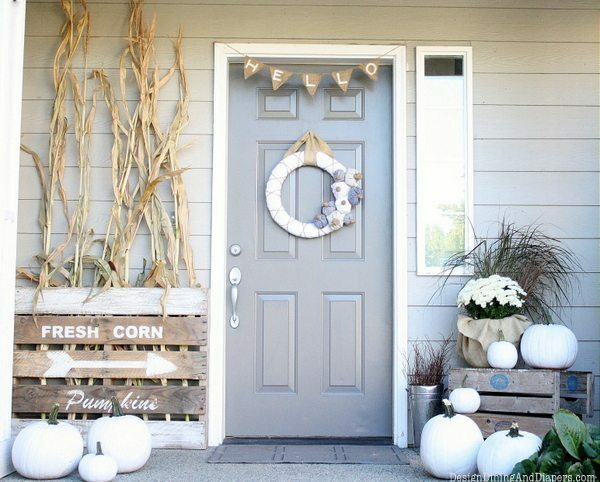 You can use these outdoor decorations all fall. The farmhouse theme works so well. It creates an inviting and cozy decor – a treat to every guest. 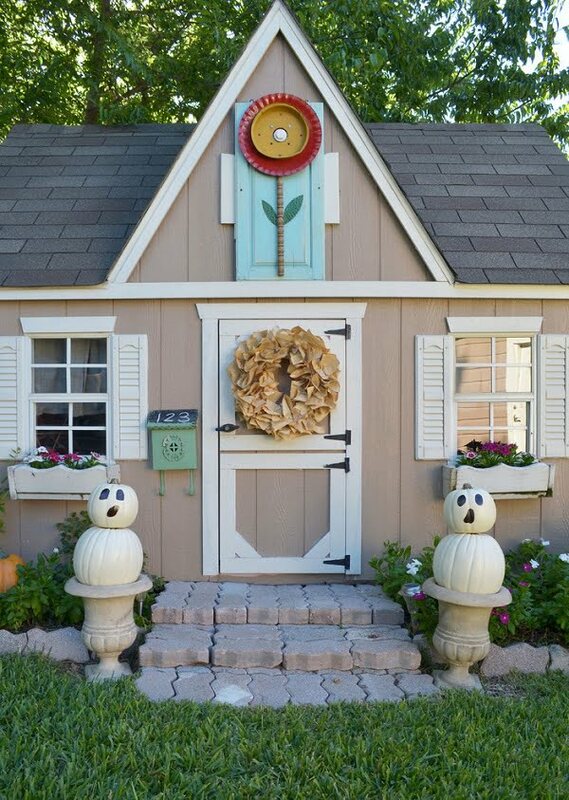 For Halloween, you can easily add some lanterns, carved pumpkins, skulls, and other accents. You don’t have to try too hard either. With some thought out placements, this stylish decor will get a lot of compliments. These DIY pumpkin planters will work in any fall season outdoor decor, including Halloween. 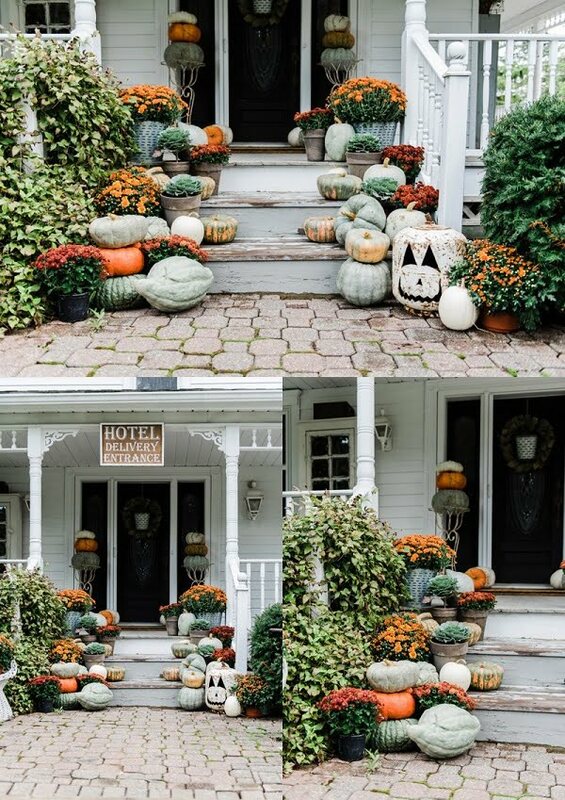 Carving huge pumpkins and making flower planters from them is a great way to create unique and whimsical decor. The planters will be a conversation piece and add charm to your outdoor Halloween decor. Now, let’s find some pumpkins big enough for the project. If you want a different way to decorate with pumpkins, get or create some lighted props and stack them up. It makes a great focal point of your outdoor Halloween decor. You can add them to a bucket of flowers too, which creates a charming fall accent. We love the use of flowers even in Halloween decorations. It’s a lovely break from all the spookiness! It’s time for something special for our woodworking lovers. Why not make a pumpkin decoration from reclaimed wood? It’s a great rustic project and a terrific decor accent for outdoor Halloween decor. You can paint your new pumpkins in Halloween colors too. Make Jack O’Lanterns from them, and you can even light them up with string lights. The possibilities are endless if you use your creativity. Jack O’Lanterns and carved pumpkins are all great, but what if you’re not into the idea of cutting them? There are ways to get around carving if you don’t want to do it but still, want to decorate with some pumpkins. And here are some no-carve pumpkin ideas especially for you. This article will show you several ways to paint and decorate pumpkins so that they’re as good as carved. Sometimes they make even better decorations. Up until now, there weren’t outdoor Halloween decorations that scary on this list. That’s about to change. 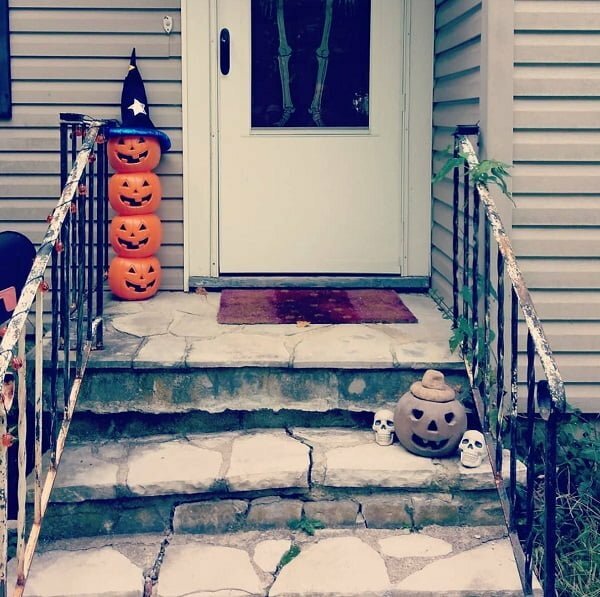 Take a look at these ideas for a spooky front porch. From spiders webs to scary signs, from skulls to pumpkins and crows. 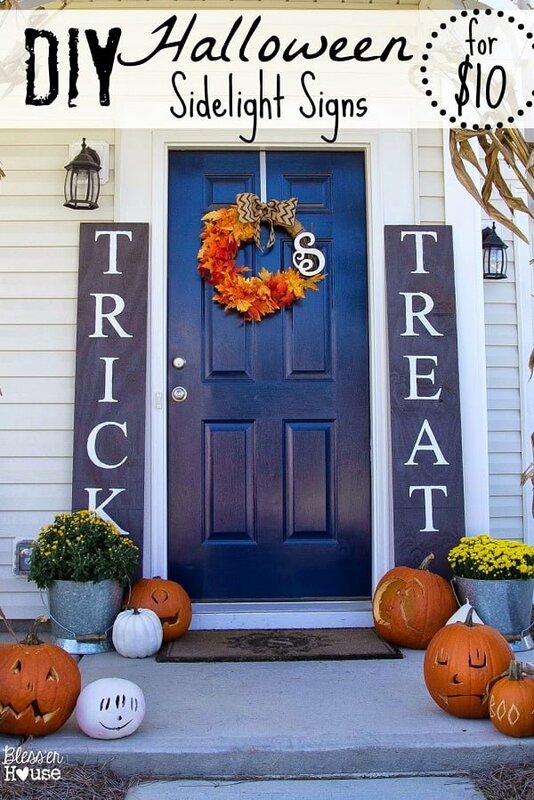 Make use of some of these ideas, and your trick or treaters will have a bit of a scare when coming to your door! 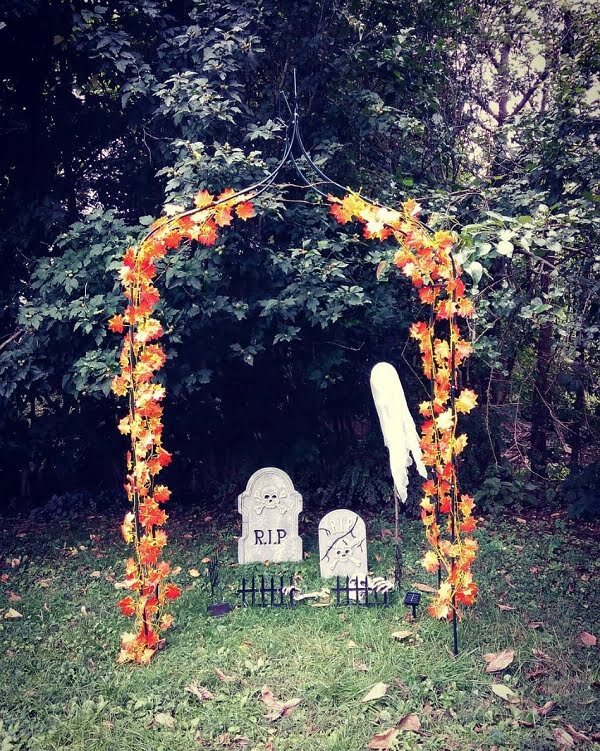 If you’re up for a more elaborate Halloween project, try building a Jack O’Lanter archway in your front yard. It’s a great idea for something unique that leaves a lasting impression. 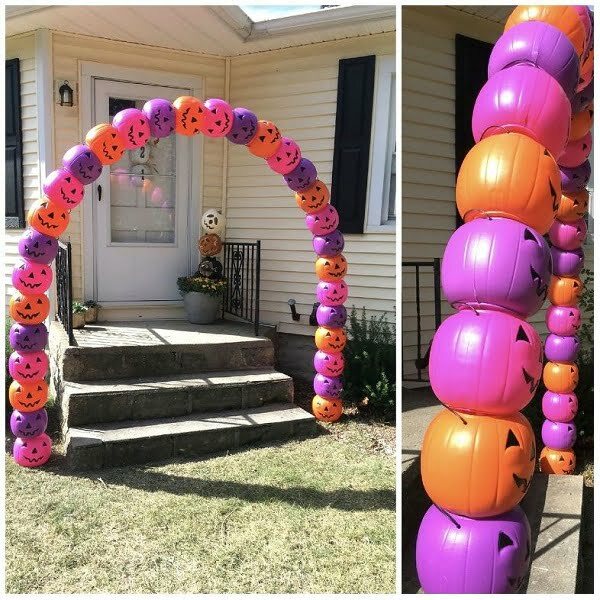 The archway can be scary or cute – it all depends on the pumpkins you choose. But don’t stop just at building the arch, use Halloween lights to illuminate it for a better effect. Some witty Halloween decor accents will always be a hit. 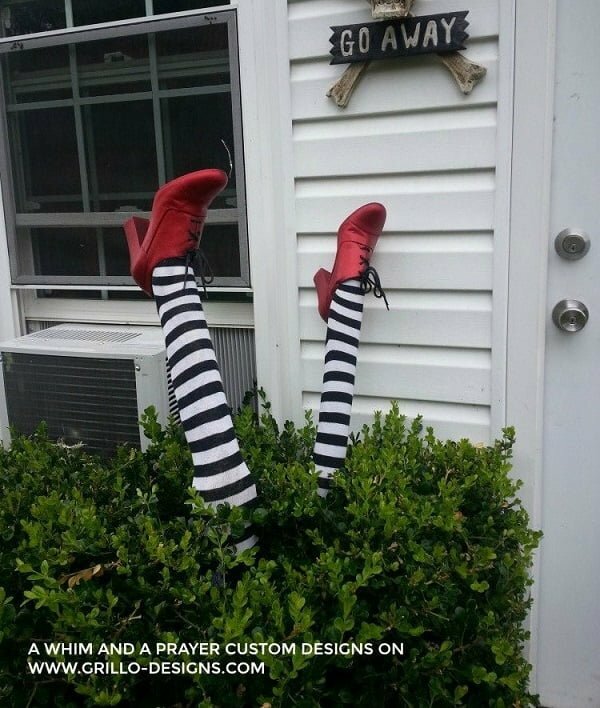 These DIY wicked witch legs are one of those decorations that get a few laughs. They are easy to make too. Check out this tutorial and put some witch legs in a bush near your front door or the front yard. That is sure to get attention. It’s always fun to decorate for Halloween with bats. They are small, they can be cute or spooky, and you can use a lot of them. The more bats you add to your decor the better. 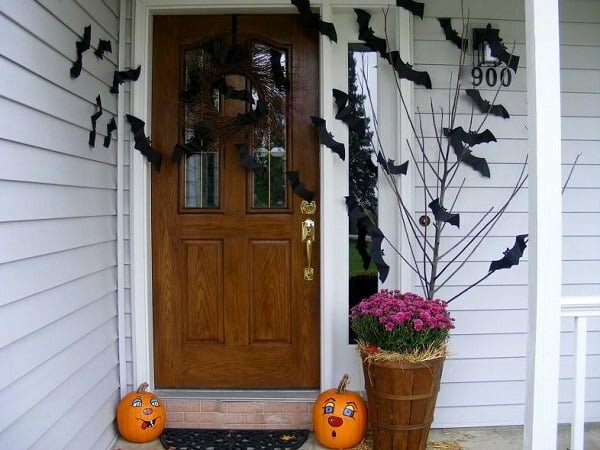 So this idea of going batty in your outdoor Halloween decor is a fantastic example. 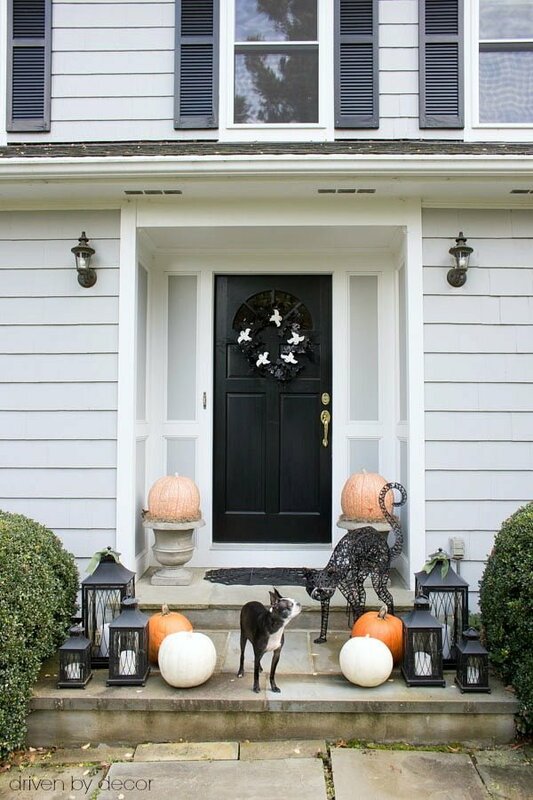 The black Halloween wreath and bats popping all out of it is a great way to create spooky front door decor for the occasion. Check out the tutorial to see how it was done, and you can try doing the same too. 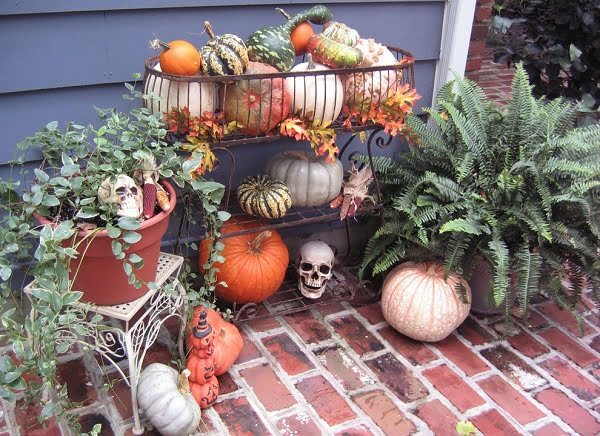 Put up a rusty old rack with multi-color pumpkins and add some skulls to the mix. That’s a beautiful outdoor Halloween decoration for your porch. 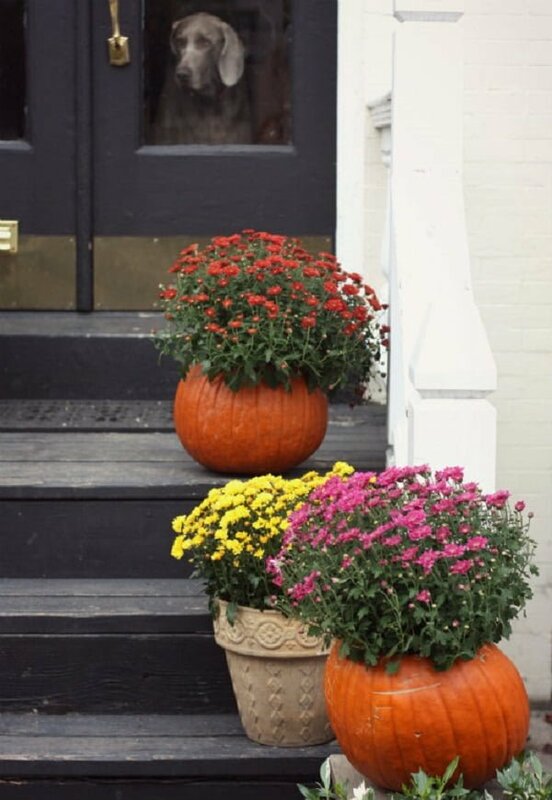 If you have some flower pots already in your porch, add some Halloween accents to them too. It’s easy to do! Did you know you can make ghosts from pumpkins? That’s a unique way to go about your outdoor Halloween decoration. 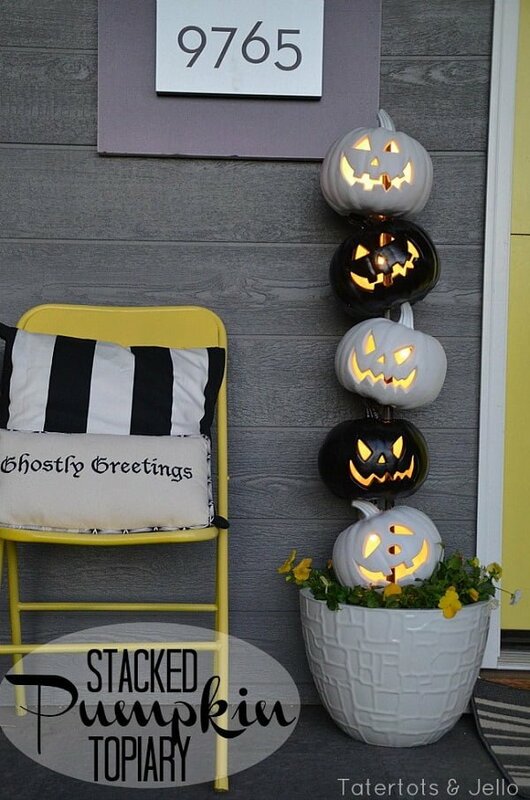 You can make these ghost doormen by stacking up white pumpkins. And come Christmas, they’ll come through as decorative snowmen! So, what else can we do with pumpkins? How about building a carved pumpkin totem for outdoor Halloween decor? Illuminate it with string lights and add a witches hat on top and you have a terrific prop. Yes, we do have tombstone decorations on this list. They’re a must in your front yard during Halloween. So go ahead mix some concrete, or buy a few tombstone props for your outdoor decor. They’re always a hit among trick or treaters! We hope you’re good at creating decor vignettes. After all, they make a great way as a go-to decor trick whenever you need to spice it up for the occasion. Pumpkins, fall leaves, rustic furniture, and cozy blankets. What else does this decor need? How about a witty sign? It’s all about the front door when it comes to outdoor Halloween decor. But don’t forget your windows too! Even by adding a small Jack O’Lantern to your windows will make your decorations look complete. So go ahead and put them up – it’s an often overlooked detail, but it’s so easy to fix! If you have artistic painting skills, make sure you use them in making your DIY Halloween props. After all, a cute witches house painted on a pumpkin or a makeshift sugar skull can easily make a conversation piece from a regular pumpkin. And that will work well in any Halloween party, let alone with trick or treaters. Tombstones can be used not only on your lawn. 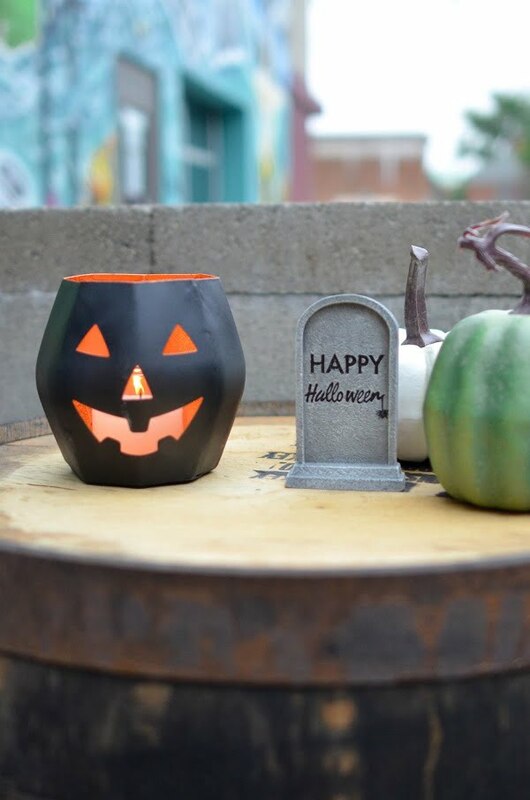 You can add cute little tombstones to any tabletop you have on your porch. This idea will work just as well inside too. Everyone loves thoughtful Halloween accents!